Six of the members of the robotics team pose with their robot Friday. From left to right are Jacob McCloskey, Megan Fanok, Dominic Hupp, Eric Puthoff, Jonah Wallace and Sydney Krewson. Matt Thompson is also a member of the team, but he is not pictured. The Delaware Hayes High School robotics team tests and tweaks a robot Friday afternoon. The robot had to function on its own for 30 seconds and could be remotely controlled for two minutes. The goal was to collect as many cubes and spheres as possible in the allotted time. The Delaware Hayes High School robotics team travelled to Austintown Saturday where it qualified for the state competition in February. The students — Jonah Wallace, Eric Puthoff, Megan Fanok, Syndey Krewson, Jacob McCloskey, Dominic Hupp and Matt Thompson — had to design a robot that could function autonomously for 30 seconds and then be controlled remotely for two minutes in order to collect as many spheres or cubes as possible. The students are all part of the robotics class being taught by Andrew Borzok, who said the team has worked hard both on building the robot and fundraising enough money to compete. Borzok said the team fundraised at events like November’s First Friday, and it was sponsored by Luvata, Innopak and Ryan Reynolds. Borzok said the team learned about their criteria for the competition in September and has been designing and testing the robot ever since. The team — “Rust in Pieces” — said it began the project trying to do everything together, but team members decided it would be more efficient to split into two teams and come up with two designs just to have one as a backup. “At first we tried to do everything together, but we ended up splitting into different teams and building different robots so we could test different ideas,” Hupp, a junior, said. On Friday, Hupp said he’s never been in a competition like this before, and he was nervous about the competition. “It’s definitely a first, and I’m excited to see where it goes,” Hupp said. Wallace, also a junior, said he liked the fluid nature of the process. Fanok, a senior, worked on the backup robot, and she was nervous and excited for the competition. “I’m excited for a new challenge and coming up with new ideas,” Fanok said. Fanok added she hopes to study mechanical engineering in college, and a big thing she learned during the project was time management. Krewson, a senior, helped build the robot and was responsible for the robot’s wheels. “I learned a lot in building, like how to work motors,” said Krewson, who added she’s also planning to study mechanical engineering. McCloskey, a senior, said he’s planning on studying aerospace engineering in college, and he enjoyed the project and being part of the team. “I got a better idea of how the engineering process works,” he said. Borzok said Saturday that the team was part of the winning alliance and will be taking part in the state competition in February. Borzok added that the team was given an award for promoting STEM in the school and the community. 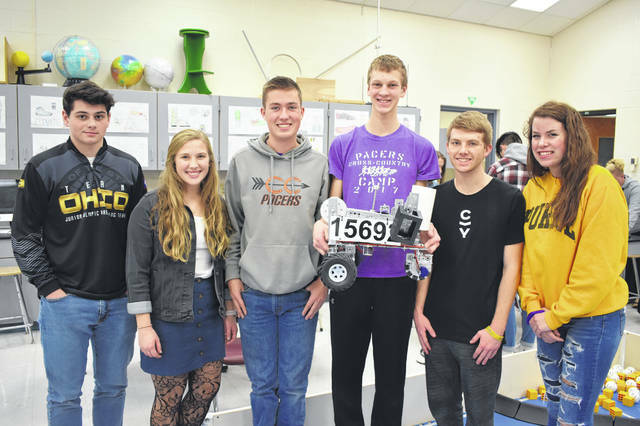 https://www.delgazette.com/wp-content/uploads/sites/40/2018/12/web1_DSC_0906.jpgSix of the members of the robotics team pose with their robot Friday. From left to right are Jacob McCloskey, Megan Fanok, Dominic Hupp, Eric Puthoff, Jonah Wallace and Sydney Krewson. Matt Thompson is also a member of the team, but he is not pictured. 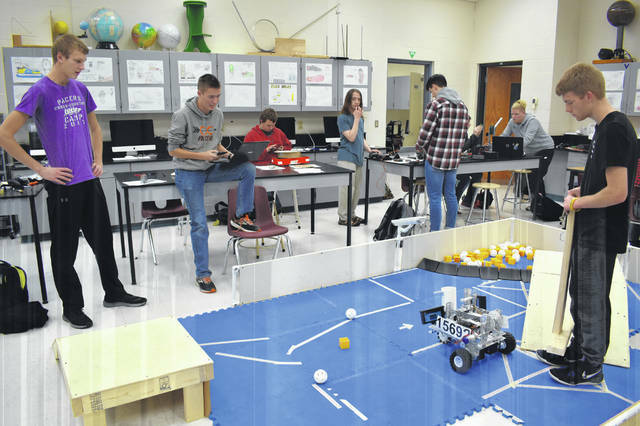 https://www.delgazette.com/wp-content/uploads/sites/40/2018/12/web1_DSC_0908.jpgThe Delaware Hayes High School robotics team tests and tweaks a robot Friday afternoon. The robot had to function on its own for 30 seconds and could be remotely controlled for two minutes. The goal was to collect as many cubes and spheres as possible in the allotted time.